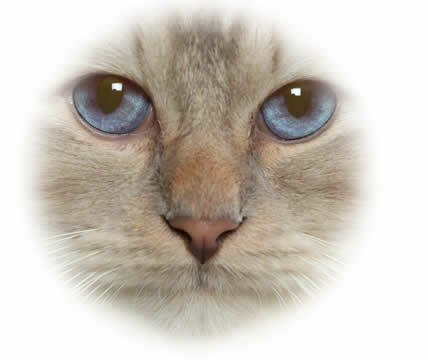 The Birman, also known as the Sacred cat of Burma, has a romantic legend to explain its appearance. Centuries ago, the Khmer people of Asia built beautiful temples of worship, to pay homage to their gods. In the Temple of Lao-Tsun lived a golden goddess with sapphire blue eyes, she watched over the transmutation of souls. The Temple also housed 100 pure white cats, who were cared for by the priests. Mun-Ha, one of the most beloved of priests - whose beard had been braided with gold by the great god Son-Khio, often knelt in meditation before the golden goddess, Tsyn-Kyan-Kse. Mun-Ha loved one of these beautiful white cats he was called Sinh, the cat was always at the priest's side, gazing at the brilliant goddess, as his master prayed. One night, as the moon rose and Mun-Ha was kneeling before the sacred goddess, raiders attacked the Temple and the priest was killed. At the moment of Mun-Ha's death, Sinh placed his feet upon his fallen master and faced the golden goddess. Immediately the fur on his white body was as golden as the light radiating from the Idol: her sapphire eyes became his own, his ears, legs, face and tail took the on the colour of the fertile earth - but where his feet rested gently on his master, they remained white - thus denoting purity. The next morning the Temple radiated with the transformation of the 100 white Temple cats which like Sinh, reflected the golden hue of the sunset. Sinh, the Golden Cat of Burma never left the throne after his master's death: 7 days later he too died, carrying with him into Paradise the soul of his beloved master Mun-Ha. In 1919, two descendants of these cats were presented to French soldiers who had helped to protect the Temple of Lao-Tsun during a rebellion. One cat died on the way to France, but the other, a female, was already pregnant and it is believed her kittens established the breed in Europe.